Enter the second floor of the New Museum and you feel like you’ve landed in the midst of the Black Power Movement of late 60’s- early 70’s. The work is Chris Ofili’s, an English artist born to Nigerian parents who now lives in Trinidad. Night and Day is a mid-career survey of the his work. In the first gallery, giant canvases surround the walls. Ofili’s controversial The Holy Virgin Mary is found here. 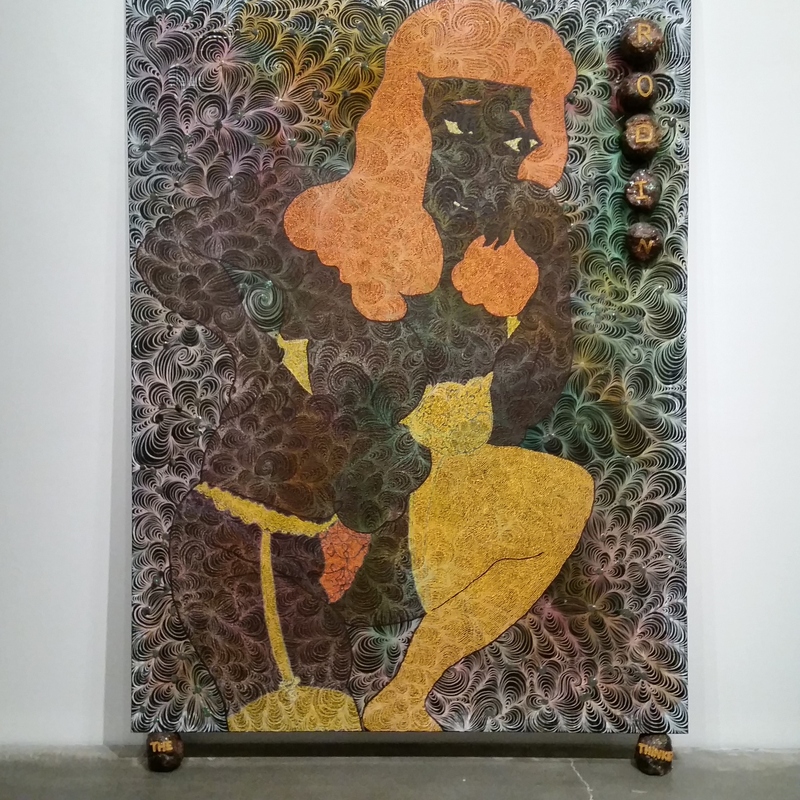 This painting and others in the gallery are massive – painted with tiny glistening dots with collaged images of erotica and famous black celebrities. Stuck onto many of these paintings and serving to prop them up is elephant dung. These works are racy, provocative and unsettling. On another floor of the museum hangs what at first glance seem like monochromatic paintings. But the work is lit with subdued lighting so, as you move through the space, the paintings change and figures and scenes begin to emerge – tropical backgrounds, a black man being hung, soldiers with weapons. Beautiful at first – but very disturbing when you really begin to see. On yet another floor the walls are washed in purples to highlight a genre of Mr. Ofili’s work which are slightly reminiscent of Matisse. The show also has over 100 small watercolor portraits of men and women in full face or profile, his“Afromuses”. 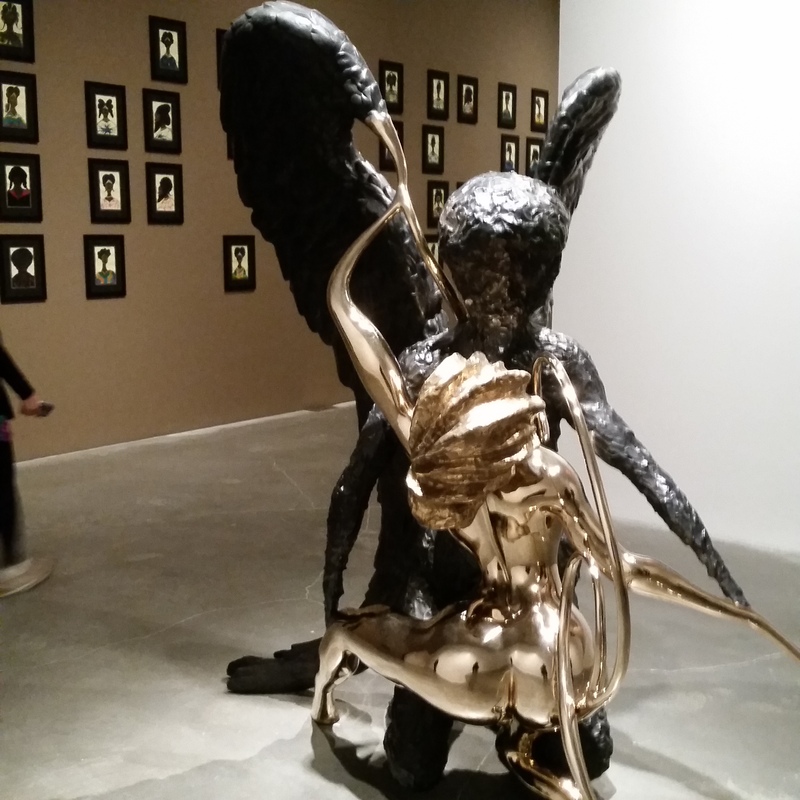 And there are a few of Mr. Ofili’s sculptures (which if you follow us on twitter, we reproduced with fun captions).